The process of innovation starts with understanding your business challenge and the environment in which your business operates (or is looking to expand into). We take a systems view of business challenges. This means we target the cause of the problem, not the symptoms so you can develop a sustainable and effective solution. A systems-based approach to using an interaction design or gamification strategy is critical in ensuring we understand the nature of the business problem before we contemplate a design intervention. In all my design sprints, we spend a lot of time in our pre-work in defining the problem and understanding the complexity of the system that has generated the problem in the first place. An excellent reference point for this is the Cynefin model developed by Dave Snowden, Mary Boone and Cynthia Kurtz. Cynefin is based on a systems and complexity science approach in making sense of a business problem and determining an optimal strategic approach to resolving it. The model highlights five key domains or different types of systems, that helps us make sense of system behaviour and gives us clues as to how we can best respond with a solution. For example, gamification is a strategic management tool that provides a set of unique problem-solving approaches such as applications, experiences, probes and experiments. However, your gamification design decisions need to be appropriate to the system you are designing for. I have developed a model that maps the most optimal type of gamification strategy against the different systems identified by Cynefin. Every system has unique characteristics, patterns and behaviours – and your gamification strategy needs to be fit for purpose if it’s to navigate complexity effectively. • Simple. These systems are relatively stable and predictable. They are characterised by what Dave Snowden calls known knowns within the system and therefore we can apply best practice approaches to problem solving. For example, in a stable process such as a manufacturing production line, there is a definitive set of known problems that arise, and well-established solutions that can manage those problems. • Complicated. These systems are also relatively stable however they’re more intricate than those in the simple domain and require higher level, expert analysis and expertise for problem solving. The “best practice” that works in simple systems doesn’t necessarily apply here as constant analysis and re-evaluation is required to solve problems and improve performance. Instead, we focus on ‘good practice’ as a range of right answers can be applied in these systems. • Complex. These are turbulent often nebulous systems that are unpredictable and constantly changing. They are characterised by unknown unknowns that require safe-fail experiments and probes to discover what we don’t know to try and make sense of the situation – and often this can only occur in retrospect. Traditional management tools and “best or good practice” approaches are ineffective in these systems. Examples of complex systems are battlefields, ecosystems, markets and corporate cultures; systems that have many interconnecting and interdependent variables with significant knowledge gaps and time lapse between case and effect. The majority of our most challenging contemporary business problems tend to fall in the complex domain. • Chaotic. These systems occur in situations where conditions are too confusing for knowledge-based responses and causality is incoherent. Novel approaches are required to make sense of the chaotic situation in order to stabilise the system and then lead it towards the relative stability of the other domains. The key requirement in this domain is to take decisive action to establish order, then make sense of the situation for a more considered response. Examples of chaotic systems are systems in collapse or adjustment situations such as the global banking financial crisis, or disaster or emergency response situations such as September 11. • Disorder. This is a transient state that system may fall into when there is a lack of clarity about the situation which could be for example, the first early phase of a system collapse before action is taken. Snowden suggests that in this situation, you break down the problem to its constituent parts and assign pieces to the different domains and manage accordingly. Simple and complicated systems are largely ‘ordered’ and can be analysed in terms of cause and effect. Complex and chaotic systems however are largely ‘unordered’, and cause/effect cannot be easily deduced (if it all) as they are largely complex adaptive systems. This means that an understanding of one part of the system does not equate to an understanding of the system as a whole. But don’t worry, this knowledge about systems doesn’t necessarily take the fun out of your gamification strategy! The majority of gamification examples that we see in the market have been designed for simple systems. Designers here look for a well-defined problem statement, a specific target audience and a quantifiable target outcome. For example, all learning and development, recruitment, marketing and sales gamification initiatives have been designed for simple systems i.e. they are designed to maintain best practice, build a specific skillset, improve on a sales target or change a set of behaviours within an existing known or ‘simple’ system. For example: Rabobank gamified their loan processes so that staff and customers understood and adopted the new online application process. Siemens developed Plantville to teach their young engineers about how to run an engineering plant. KPMG developed the game Globerunner so staff better understood the full range the firm’s consulting services. The gameplay in these examples is linear which means that it is designed as a straight-line transfer of existing knowledge, information or skills to known situations. Answers to challenges are either right or wrong and the overall outcome of the game is the maintain or enhance the status quo. An analysis of my database of enterprise gamification examples shows that around 70% have been designed and implemented for ‘simple systems’. In dealing with “known unknowns” in a system, Nike introduced their Nike+ running apps to gain greater visibility and understanding of their customer profiles, preferences and behaviour. These applications enabled them to generate the additional data and insight they needed to develop more informed decisions on product sourcing, manufacturing and marketing. Similarly, many basic ‘innovation ideation’ gamification using crowdsourcing are used by organisations to introduce greater levels of incremental innovation by building their knowledge base and facilitate greater internal team collaboration. For example, Citi created the Future in Banking Challenge to run internal innovation challenges and used a third-party platform for idea generation and innovation management. Other examples in complicated systems include ‘many-to-many’ problem-solving platforms such as Stack Overflow and the SAP Community Network. These platforms have been gamified to enable and encourage engineering, developer and user communities to help each other solve problems with software deployment by sharing knowledge and potential solutions. The gameplay that is designed for complicated systems is non-linear and aims to introduce a greater level of co-operation between players (staff, customers, and other stakeholders) to fill knowledge gaps in the system and apply good practice. The gameplay and technology in these applications require a greater level of player autonomy and interaction (a pull model) compared to simple systems gamification which tend to be ‘push models’. From my database, approximately 20% of gamification examples fall under this category. Most of our challenging business problems today belong in the complex domain, however gamification applications here are not that common. These gamification applications are challenging interventions as they require more sophisticated, emergent and open-ended gameplay to be designed and developed. Key examples here are ‘citizen-science’ games that have been developed to investigate unknown elements of a medical or scientific sub-system though controlled gamified probes and experiments. The well-known example here is the massively multiplayer online game (MMOG) FoldIt which started as a scientific problem that evaded university researchers for 15 years and was solved within 3 weeks after the game was released. The gamification strategy used here was an experimental probe that was part game, part simulation that used crowdsourced sensemaking and knowledge creation. From my database, approximately 5% of gamification examples fall under this category. Gamification interventions for chaotic systems tend to be treated as pre-emptive experiential learning experiences that are intellectually and emotionally challenging. In a chaotic system you need to act decisively as the aim of leadership is to stabilise the system, minimise damage, and ‘shape shift’ it towards growth and positive development. Therefore in these systems, it’s the training that occurs before chaotic events occur that counts. For example: the Red Cross uses role-playing simulation games, improv training and board games to develop the mental preparedness of their field managers in emergency response and disaster relief. The focus of the gameplay is co-operation among players for capacity building and resilience. Organisations operating in chaotic systems also play War Games to test strategies, scenarios and build the personal capacities of stakeholders in leadership, emotional intelligence, team-building and decision making. Various role-playing games (RPGs) have been used by executive teams in business simulations (both physical, digital or tabletop forms), or have formed guilds in existing commercial MMOGs such as World of Warcraft and League of Legends to develop the mental agility of working in teams under stressful and chaotic ‘do or die’ situations. Another genre of games that can be used are alternate reality games (ARGs) which are transmedia storytelling games that use the real-world (and real-world problems) as a platform. For example the ARG World Without Oil taped into the collective intelligence of players to work through chaos scenarios as our planet and communities adjusts to massive oil shortages. 1. Understand your system. Be objective and realistic of the systemic challenges you are facing now, and where your system may be heading (systems are not static). A system creates it’s own behaviour and is largely impervious to your ‘change management’ efforts to change staff or customer behaviour. 2. Ensure you have a deep understanding of the problem. Navigate the wider problem space and ensure that you are looking for weak signals amongst the obvious. 3. 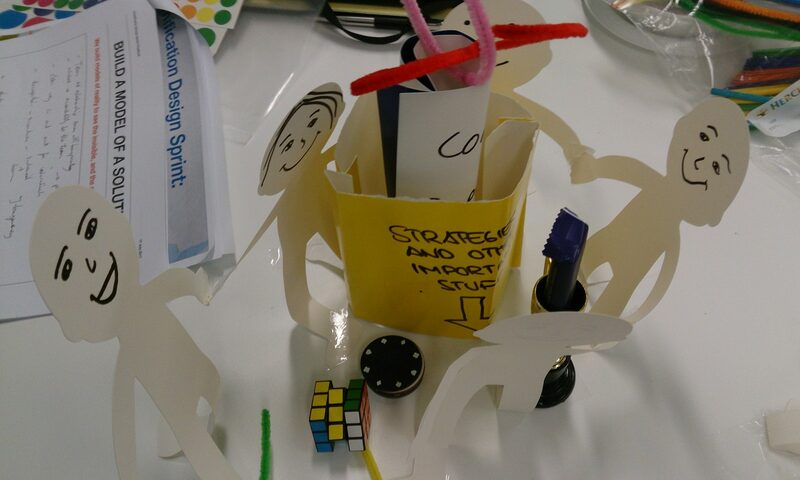 Design a gamification strategy that is fit for purpose. The type of game, gameplay, how it is designed and the enabling technologies that are used to deliver the experience will have a significant impact on the quality of the outcomes. 4. Test all the underlying assumptions, values, mental models that have been incorporated into your gameplay – you may inadvertently replicate the traditional way you think and go about about your business. Hint: many game engines simply reflect traditional command/control systems and may not generate the level of creativity and innovation you may be looking for. 5. Get out of your comfort zone. Gamification introduces a new experience and a different way of thinking and collaborating in your organisation that can challenge your traditional approaches – embrace the challenge. Your gamification project is a strategic management tool – it needs to be a well-designed and well-placed intervention that is suited to the specific problem you need to solve.